CDM Electronics, a premier authorized distributor of electronic connectors and cables, is now a stocking distributor of Times Microwave Systems’ new LMR-LLPX series of flexible low loss plenum coaxial cables. LMR-LLPX cables meet all state and federal (NFPA 90A) building code requirements and have a UL/NEC and CSA rating of CMP and FT6 respectively (listed under UL file #E-170516). Offered in sizes of 195 to 1200, they feature the same low attenuation, flexibility, and bendability as the standard LMR series. 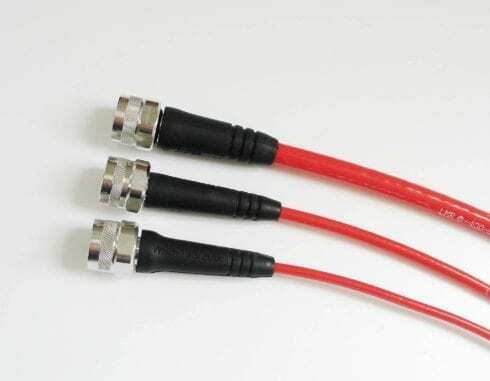 LMR-LLPX cables are supplied with a fluoropolymer red jacket to meet and exceed the requirements for red jacketed coax cable employed in public safety and in-building applications. Times Microwave Systems’ new LMR-LLPX plenum rated cables are a drop-in replacement for the company’s LMR series and are available as pre-terminated cable assemblies. LMR-LLPX plenum cables and/or cable assemblies may be ordered online from CDM Electronics and are in stock for fast delivery. -40° C to +125° C, higher power handling, and lower coefficient of friction for easier installation. Further benefits include improved cut-through and abrasion resistance, coupled with advanced chemical and overall UV resistance. Highly fire retardant LMR-LLPX indoor cables are specifically intended for runs within return air handling plenums (e.g. dropped ceilings, and raised floors), as well as for plenums that originate outdoors (e.g. rooftop) and subsequently enter the building. They are particularly appropriate in wireless applications, including LMDS, MMDS, WLL, GPS, LMR. WLAN, WISP, WiMax, SCADA, cellular, PCS and paging. LMR-LLPX cables may be confidently specified in new construction and in the refurbishment or expansion of commercial, public, and private buildings. Moreover, these cables are a safer replacement to existing riser cables that are run between floors in non-plenum areas. In addition to featuring a flexible outer conductor which enables the tightest bend radius of any cable of comparable size and performance, LMR-LLPX cables have the lowest loss of any flexible cable and boast a comparable loss to semi-rigid hard-line cables. Their RF shielding is 50 dB greater than typical single shielded coax (40 dB), while their multi-ply bonded foil outer conductor is conservatively rated at >90 dB (i.e. >180 dB between two adjacent cables). CDM ships LMR-LLPX cables and/or cable assemblies pre-terminated with a variety of standard 195 to 1200 Times Microwave Systems’ RF connectors. They can be prepped with a standard CST-series strip tool and terminated with a standard CT-series tool. Additional jacket colors are also available. To learn more, email sales@cdmelectronics.com or call (877) 386-8200. For over 25 years, CDM Electronics has delivered interconnect product and cable assembly solutions to the world’s leading aerospace, military, telecom, automotive, industrial, commercial, and alternative energy providers. Renowned for its unsurpassed levels of customer service and support, the company supplies Original Equipment Manufacturers (OEMs) with full lines of standard and specialty connectors including circular, Mil-Spec, DIN, power, PROFIBUS , rectangular, and RF devices. CDM employs documented and controlled systems in its value-added division, which specializes in mission critical cable assembly, including custom cable assembly, military cable assembly, power cable assembly, and box builds. The company’s ISO and AS9100 Certified headquarters is in Turnersville, NJ. Regional offices are located in Irvine, CA, Plano, TX, Reading, MA, and Williamstown, NJ.